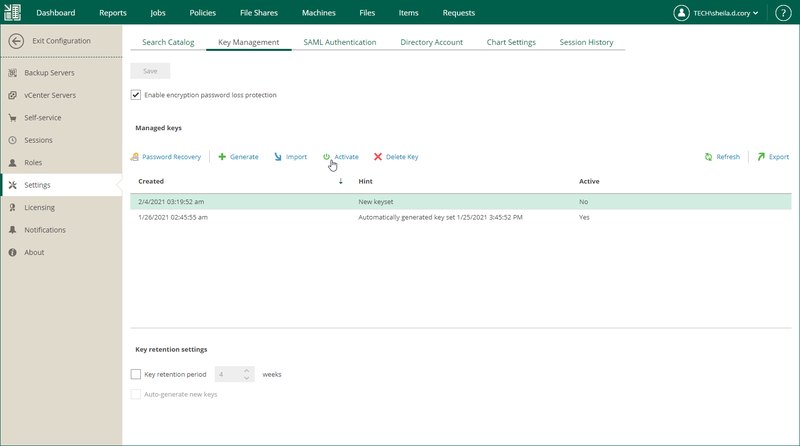 Public Enterprise Manager key encrypts storage keys on Veeam backup servers connected to Veeam Backup Enterprise Manager. Private Enterprise Manager key decrypts storage keys in case a password for encrypted backup or tape is lost. Public Enterprise Manager key is propagated to all Veeam backup servers connected to Veeam Backup Enterprise Manager. Private Enterprise Manager key remains on Veeam Backup Enterprise Manager and marked as active. Select an inactive keyset in the list. Click Activate on the right of the list. Note that manual activation can be performed for any keyset in the list (generated manually or automatically). If you want your automatically generated keysets to be activated automatically upon creation, then you should configure the retention policy settings. For more information, see Specifying Retention Settings for Enterprise Manager Keyset. Consider that manually generated keysets will require manual activation.